“A man enters the kitchen for one reason,” declares Biji, aging matriarch of the Chaudhary family of Moga, Punjab. “To change the gas cylinder.” Her son, Balbir Chaudhary, grew up wanting to become a masterchef and not a businessman, but was prodded out of his culinary interests by his dominating mother, who still raises hell if she finds him sneaking around the stove. It’s a nice (if unsubtle) touch about how gender norms are transferred within family, and how patriarchy operates across age and gender. Director Shelly Chopra Dhar tosses together some decent ingredients and a meaty subject for her debut film; expectedly though for a first-timer, it’s her cooking that needs to be better. The unwieldy title of Ek Ladki Ko Dekha Toh Aisa Laga — besides weighing down newspaper headlines and straining the upper jaw — pays tribute to a hit song in the Anil Kapoor and Manisha Koirala-starrer, 1942: A Love Story. Released in 1994, that film about lovers separated by imperial loyalties was directed by Vidhu Vinod Chopra, the producer of ELKDTAL, and Shelly is his sister. 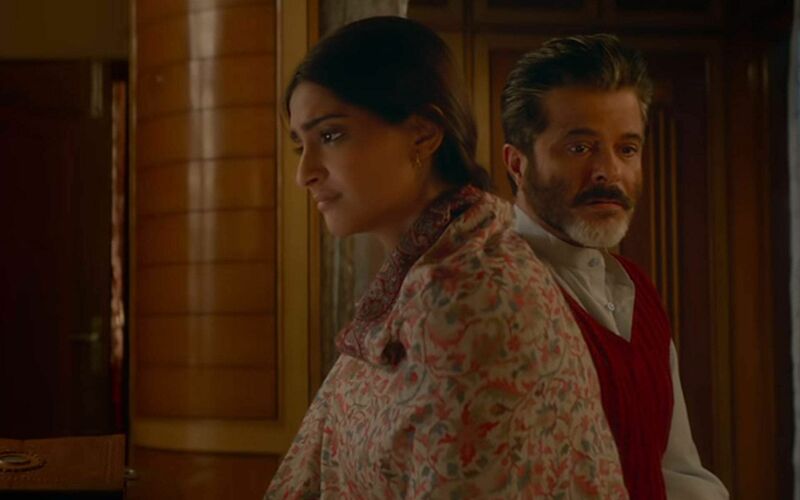 62-year-old Anil, who played the rebellious, cycle bell-clanging lover in the previous film, wears white whiskers and becomes the conflicted father in this one, while his own daughter Sonam steps into his place. So far the 'meta-ness' looked warranted: a real-life father-daughter duo advocating for an urgent cause (thus inspiring those in the audience); and a nice reworking of a classic Hindi film lyric. In fact, for a good moment, it seemed that this film — about a closeted lesbian girl coming out to her conservative family — was (in quiet but resolute ways) trying to upend some deep-held conventions about mainstream filmmaking, taking us on a colourful ride but also pulling the rug when the time comes. Sadly though, regardless of the presence of Rajkummar Rao, an actor who best exemplifies the changing face of Indian cinema, ELKDTAL falls back upon some grossly worn-out tricks and stock resolutions. It's unimaginative story-within-a-story structure falls apart really quick, revealing a screenplay that confuses cheekiness with true subversion, and a narrative that simply circles the subject of prejudice instead of straight-out confronting it. Rajkummar plays Sahil Mirza, a playwright and theatre director looking for inspiration for his insipidly-written plays, who falls in love with the shy but bewitching Sweety Chaudhary (Sonam Kapoor). The film takes an agonizing amount of time to get to the point, though the actors are convincing in their parts. Sonam holds her own even in certain scenes that might seem beyond her skill (like Neerja or Raanjhanaa, the intelligent casting helps here, though there are times she adds a needless and emphatic lilt to her lines: “Why does everyone think in the same direction?” she exclaims aloud in one scene, speaking not to her co-star but to the audience at large, killing all intimacy in the moment). Anil Kapoor’s presence in the film is warm and likable, but he fails to work up any dramatic tension as the disapproving dad — they all melt in the end, don’t they? What is a Hindi film if not suffixed by an elderly man ‘forgiving’ — or better word, ‘understanding’ — his errant kids? It’s hard to enjoy a film that has, in its mind, already antagonised the audience. The hush-hush handling doled out to homosexuality in this film — releasing, ironically, a day before the Mumbai Pride Parade — is bound to do more damage than good. Here's a story that is more concerned about the squeamishness of the Indian viewer than the emotional journey of its characters. Too many caveats are offered, needlessly and with the aid of music, like a Sooraj Barjatiya classic painted over with a rainbow. The condescension hurts. “Go to another small-town with your play,” Sweety tells Sahil in the ending railway station scene, “and rescue a girl like me.” Faced with that wonderful thought, Rajkummar smiles and gets onto the train — the great male saviour of our movies, onward another epic journey. Ek Ladki Ko Dekha Toh Aisa Laga is a superficial film with none of its promised subtlety. It sullies a debate in the name of opening it up, and folds up as nothing more than a cloying Bollywood fare. We’ve had enough movies aiming for the heart — about time we make them for the mind?